Cache Valley was originally named Willow Valley because of the abundant willows growing along its many rivers and streams. Later, the name was changed to Cache Valley for the practice of early fur trappers to cache, or hide, their furs in the area. The valley is about 50 miles long, 20 miles wide, surrounded by rugged mountains, and straddles the Utah-Idaho border. It is a green oasis in the arid west, and even greener because of the irrigation system that was established by early settlers. It was originally only known to Indians (primarily Shoshone and Ute), then trappers. But soon after the Mormons settled in the Salt Lake Valley in 1847, they began colonizing nearby areas. The first settlement in Cache Valley was at Wellsville in 1856, though cattlemen tending Brigham Young’s herds were here earlier, encountering the area’s cold winters, which killed the cattle and prevented settlement efforts until a few years later. 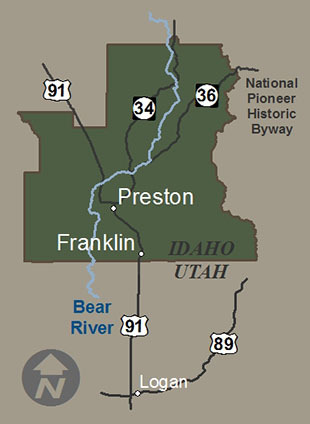 The southern or Utah portion of Cache Valley hosts 80% of the valley’s population, with the northern end in Idaho being more rural.